Professor Osinbajo made the pledge at the 2017 National Productivity Day in Abuja, the Federal Capital Territory. According to him, the current economic realities indicate that continued dependence on importation is not sustainable. He, however, called for the patronage of made-in-Nigeria goods. “Permit me to make a comment on made-in-Nigeria initiative, which has also been recognised here. 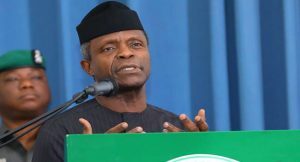 “As the president said in his 2017 budget speech, we must grow what we eat and we must use what we make; we must patronise made-in-Nigeria products to encourage local production,” Professor Osinbajo said. In his opening remarks, the Minister of Labour and Employment, Senator Chris Ngige, stressed the importance of the occasion. “We are here today to celebrate and reward excellence in service by recognising individuals and organisations that have made significant contributions to the growth and development of the nation. “The National Productivity Day is therefore a day we set aside to demonstrate that high productivity is the bedrock of every economy. “It is time to reflect on ways of energising all sectors of the economy towards our goal of institutionalising productivity consciousness and excellence in service,” the minister said. The Minister of Solid Minerals, Dr. Kayode Fayemi, on his part highlighted the importance of a reward system in encouraging local entrepreneurship. “Society can only develop and be productive when our reward systems are robust and effective. “Good must be rewarded and evil must be punished; government can however, not do this alone. “It is a task we must all tackle collectively right from the family unit to our community to the nation at large. “We can only make progress and be productive when we stop celebrating criminal brigands and start recognising unsung heroes in our society,” the minister said. The National Productivity Day has been set aside by the Federal Government to promote local production of goods and services, as well as reward indigenous entrepreneurs who are contributing to the growth of the economy. At the 2017 edition, 15 individuals and five organisations were rewarded by the government for their contributions to Nigeria’s economy.